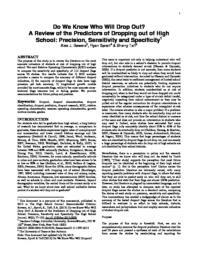 The purpose of this study is to review the literature on the most accurate indicators of students at risk of dropping out of high school. We used Relative Operating Characteristic (ROC) analysis to compare the sensitivity and specificity of 110 dropout flags across 36 studies. Our results indicate that 1) ROC analysis provides a means to compare the accuracy of different dropout indicators, 2) the majority of dropout flags to date have high precision yet lack accuracy, 3) longitudinal growth models provided the most accurate flags, while 4) the most accurate cross-sectional flags examine low or failing grades. We provide recommendations for future policy and practice. Keywords: Dropout, dropout characteristics, dropout identification, dropout prediction, dropout research, ROC, relative operating characteristic, receiver operating characteristic, growth mixture models, grades.